It was only a couple hours ago that you were biting into your lunch wondering if you were ever going to eat a sandwich that tasted as good as it looks on The Food Network; in Bon Appetit Magazine; on Saveur.com; or in one of the many cookbooks currently occupying your kitchen. Wonder on, because your sandwich is never going to taste as good as it looks on TV, in a magazine, in cookbook or even on a 20-something’s blog. Tough love, we know, but sometimes you need to hear the truth so that you can stop worrying and start celebrating the people who CAN and DO create meals that look like a Picasso painting on your plate and taste like fireworks just had a Canada Day party in your mouth. 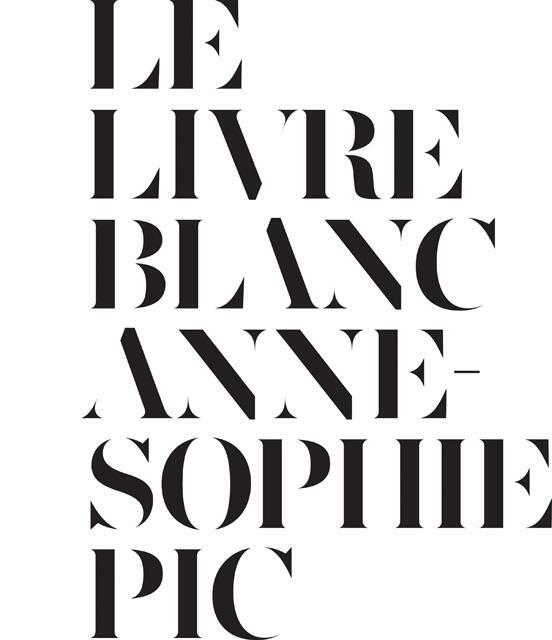 One of these people we speak of is the incredibly talented, three Michelin star chef ANNE SOPHIE PIC, who recently released her cookbook LE LIVRE BLANC with Quayside Publishing Group. There are dishes in her cookbook you will never be able to make, let alone eat (unless you're traveling to France and then we should talk, and, by talk, we mean let's be best friends), but you can ogle, drool and swoon over the beautiful spreads. That's half the fun! LE LIVRE BLAC is a cookbook that transforms everyday dishes into extraordinary works of art that both inspire and amaze. Don’t believe us? Well, believe Library Journal, because they have explained her allure quite succinctly: "Let’s face it—when most of us think about cooking, we don’t imagine filling a bowl of frothy green tea broth with artfully arranged boiled leeks, marinated anchovies, and wafer-thin coins of caviar-topped melba toast. Most readers will never cook from this title, but browsing its visually breathtaking contents, they will understand why Pic, the fourth female chef ever to win three Michelin stars, deserves her reputation. Some haute cuisine cookbooks have explicit instructions; this one does not. The recipes at the back of the book assume considerable knowledge and skill. VERDICT highly recommended for professional collections and aspirational cooks interested in elegant plating and presentation." Do you need us to break it down some more? No. Good. Now go buy the book.